Confession: I cannot have jars of Nutella in my house. It’s a problem. I just like it too much! So, when the company sent me a couple jars, I knew I had to use them right away. I have another recipe coming up in a couple weeks, but I had to use this other jar immediately. I decided to try making Nutella and banana bread muffins. I’d seen a similar recipe online and they just looked so delicious. I also made these pumpkin Nutella bars a couple years ago, and they were a major hit at work. There’s just some so perfect mixing breads (like pumpkin and banana) with Nutella. The fruit and chocolate hazelnut just work so well together. 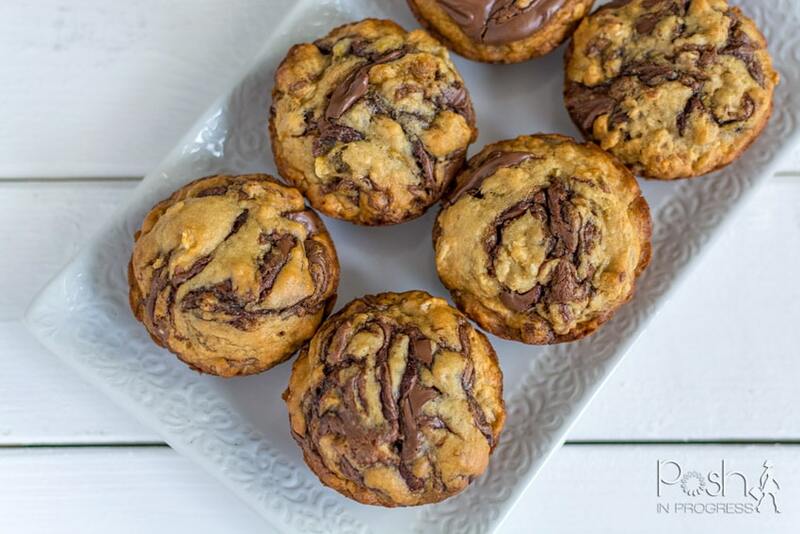 These Nutella and banana bread muffins are super easy to make. Even if you’re not much of a baker, I promise you can make this recipe. There are no complicated steps or equipment needed to make these. The best part about this recipe is that my kids enjoyed them and they are fairly healthy. They don’t have that much sugar or fat in the base of the banana bread base, and you can use as much or as little of the Nutella as you want, if you’re trying to keep the sugar count down. You could even leave the Nutella out altogether, if you’re not a big fan of bananas and chocolate. I tried two different ideas when I made these. There was nearly enough batter to make 2 dozen muffins. I think this recipe made 23 muffins. Had a been a little more careful, I could have stretched it to two dozen. For the first dozen, I topped each muffin with a slice of banana. If you love banana, this is a fun little decoration and also gives the eater an obvious nod to what they’ll be eating. They just didn’t look quite as appetizing to me as the ones without the banana slice, but still looked really yummy (kinda like this recipe). The second batch, I spent more time making sure the Nutella and the batter were well swirled, which created some really beautiful muffins. I decided to share this version with you all because, well, they just looked prettier. They all tasted great, and the ones with the banana slices were definitely a little more banana-y, if that’s your thing. 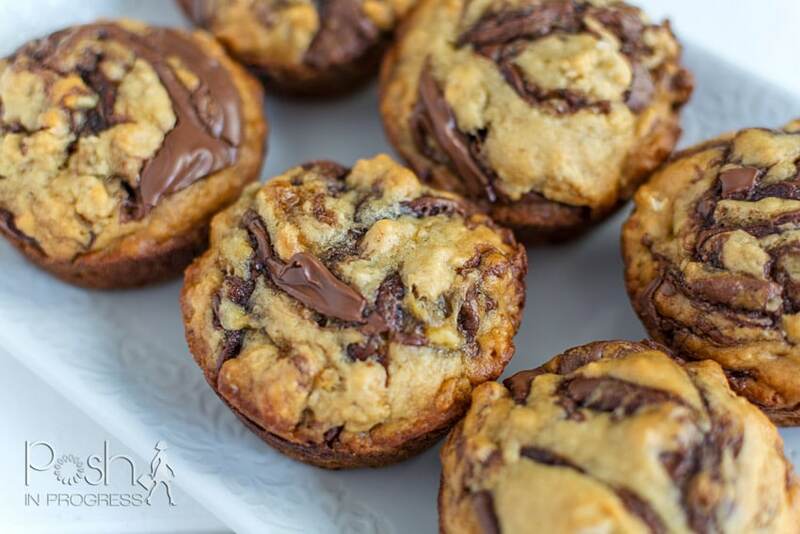 No matter which version you make, you’ve gotta try these Nutella and banana bread muffins. They are so delicious – I promise your family will love them. Preheat oven to 375 degrees F. In a medium bowl, combine flour, oats, white sugar, brown sugar, baking powder, baking soda and salt. Stir until ingredients are well combined. In a large bowl, beat egg. Add milk, oil, vanilla and mashed bananas. Sir to mix ingredients until well combined. Add flour mixture to the banana mixture and stir until ingredients are incorporated, do no over stir. Line a 12 muffin pan with 12 muffin tins or spray muffin tin generously with cooking spray. Divide batter evenly among the 12 muffin tins. 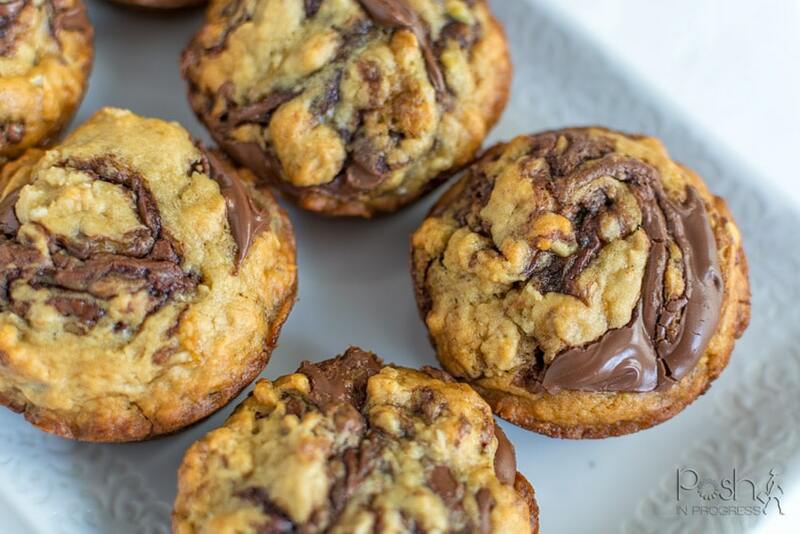 Add a teaspoon of Nutella to the top of each muffin and gently cut Nutella into batter with a knife or toothpick to produce pretty swirls. I also added a small amount of batter on top of the Nutella to make the swirling process easier. Bake at 375 degrees for 15-18 minutes or until golden brown and a tooth pick inserted in the middle comes out clean. Enjoy warm or stored in an airtight container for up to a week.